Summary : One of the more surprising teas I've had in a while, this echinacea orange tea packs a very strong sweet flavor to it. And the taste of the tea is all orange. So if you like sweet orange teas, this tea is for you. Review : It's a real bummer that the California Citrus crop was essentially frozen over this past year. The freeze caused the price of orange juice to skyrocket here in the Biggest Little City in the World. And being on a limited budget, orange juice quickly found itself jettisoned for the most part out of my diet ($4.50 for 64 ounces of OJ...I don't think so!). Yet, I love oranges. And so, perhaps out of desperation, I turned to tea this past year to satisfy my "orange fixation." And so tonight, desperate for something "orange", I pulled out an exotic sounding tea from Typhoo called Echinacea with Orange Kick...a unique herbal tea if there ever was one. This tea contains the following ingredients : Apple Pulp, Blackberry Leaves, Echinacea, Citric Acid, Roasted Chicory Root, Maltodextrin, Hibiscus, Orange Juice, Malic Acid, Flavourings, Orange Peel, Cinnamon, Rosehips, Ginger, Clove. I don't think I've ever come across a tea that contains quite this lengthy list of ingredients before. 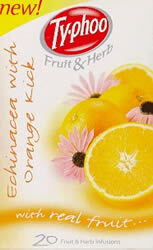 Let alone a tea that contains such diverse ingredients...from cinnamon to echinacea to orange juice. The fragrance of the tea right outside of the wrapper isn't entirely uplifting. While you can use your imagination a bit to catch the fragrance of orange in this tea, you do have to work at it. By no means does the fragrance of the tea leaves jump out and say ORANGE. But this changes, happily, as soon as you add water. Once boiling water is added, the fragrance of orange is unleashed in this tea. And so, with the happy fragrance or orange drifting around my kitchen, I waited seven minutes for the tea to brew. I must say, this tea was one of the more surprising teas I've had in a while. And surprising in a good way too. I truthfully had no idea what to expect from it, but I never expected to find a tea would ever ever come close to rivaling the strong, sweet flavor of orange like I had found in Tazo's Wild Sweet Orange Herbal Tea. But my, does this tea come close. The first sip of this tea is a real eye opener. Talk about super sweet. And I do mean SWEET. And the flavor is ALL orange. Oh, you can taste a little bit of lemon from the depths of this tea, but you have to stretch to find it. But the orange, my, what a strong flavor it is. And of course, with me being a orange-a-holic, I found the flavor of this tea to be quite pleasing if very different. So, is this tea for you? Good question. It certainly isn't if you don't like sweet, and a bit sour, teas. Likewise, if oranges aren't too your liking, this tea will not be too your liking either. But, if "sweet" and "oranges" is part of your middle name, you owe it to yourself to give this tea a try. At a minimum, it will certainly be a "unique tea tasting experience" that stands far outside any other tea flavors you are likely to find. Recommendation : Yes...assuming you like orange teas and sweet teas. This tea is really, really sweet, with a very strong flavor of orange. If you like sweet things, and orange things, then this tea must be tried. Mighty Leaf Chamomile Citrus Herbal Tea : The definition of a premium chamomile tea with a strong lemon flavor.